The Princess of Swords tarot card is an avenger of your mind. Sometimes after long bouts of depression and doubts, these negative thought forms seem to be a real thing. We often feel defeated. Princess of Swords will remove those negative thought forms. She will restore your empty altar, and remove your black cloud. She is Venus in the realm of the mind. Venus is a warrioress. The divine feminine has a nurturing aspect as well as a war like aspect. In the higher realms you see her warrior qualities. She attacks problems with ferocity. 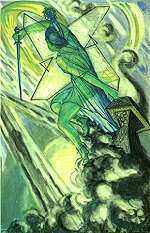 When you begin to study, or attend school the Princess of Swords is a good card to work with. She will destroy mental boundaries and bring much clarity. The Princess of Swords is a person or an aspect of your own personality.